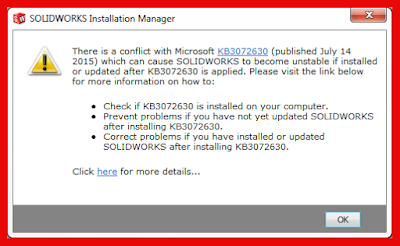 After applying the update Windows KB3072630, many people have a problem with Solidworks, namely the error "Failed to create ToolboxLibrary object". It affects 2011-2015 and Solidworks 2016 beta. Crashes when recording, playing or editing a SOLIDWORKS Macro. Missing add-ins from the SOLIDWORKS add-ins list in the Tools menu. Error when launching SOLIDWORKS or opening a file: “Could not load SOLIDWORKS DLL: GdtAnalysisSupport.dll”. Error "Failed to create ToolboxLibrary object". The error “The system administrator has set policies to prevent this installation” is displayed when attempting to apply a service pack to SOLIDWORKS with administrative rights. SOLIDWORKS Treehouse crashes when launching. From the Windows Control Panel, click Windows Update. In the left pane, click View update history. Browse the list of installed updates to check if KB3072630 was installed. If present, it will have been installed on or after July 14 2015. If KB3072630 is installed on your system please review the recommendations in the applicable scenario below. On the Windows Control Panel, click Windows Update. In the left pane, click View update history. Review the list of installed updates, to ensure that it was liustanovleno update KB3072630. If KB3072630 update has been installed on your system, check the directions to correct errors. Click Start, click Run, in the Open box, type regedit, and then click OK. Note: If this section does not exist, create it. On the Edit menu, point to New, and then click the value of DWORD. DWORD name, type RemappedElevatedProxiesPolicy and then press ENTER. Right-click RemappedElevatedProxiesPolicyi then click Modify. 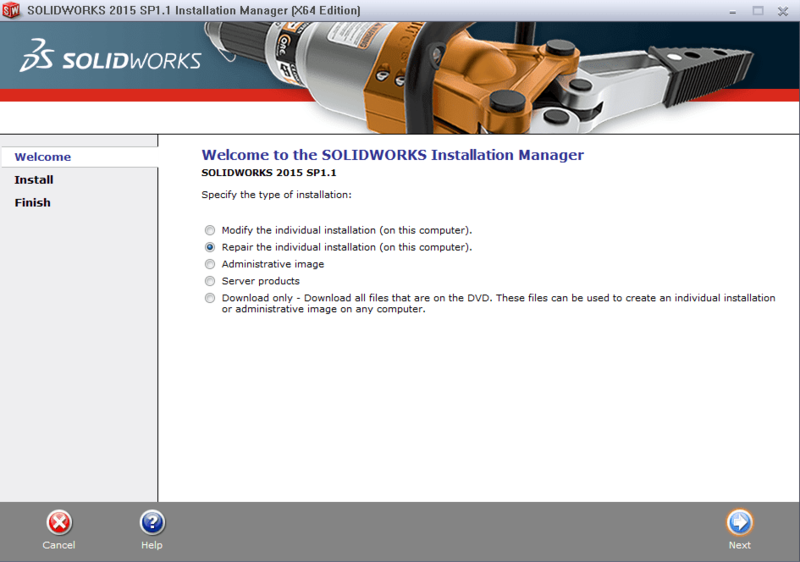 Install the required application (Solidworks). After successful installation of the application, RemappedElevatedProxiesPolicy reset the DWORD value to 0, to include Security Patch 3,072,630 KB. Download and unzip the file FIX_KB3072630.zip. After adding information to the registry, run the installation of Solidworks and select "Repair the individul installation" option. Press ‘Enter’ > this will register ‘sldworks.exe’ Reconfirm behaviour.